Claims the suspects in the poisoning of a Russian ex-spy were only in the UK as tourists are “deeply offensive to the victims”, the UK government has said. 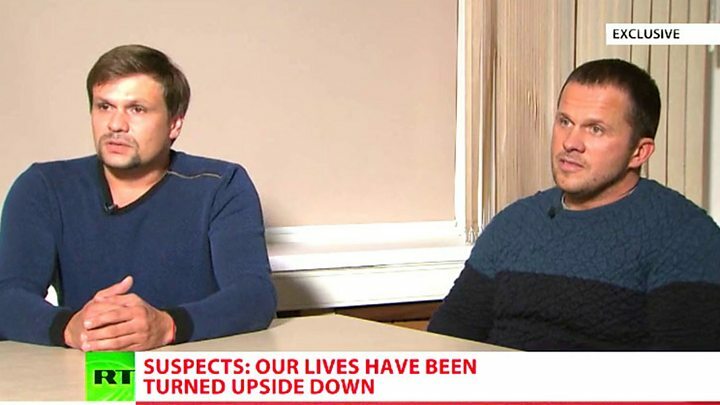 The two men told the state-run RT channel they had travelled to Salisbury on the recommendation of friends. Downing Street described the interview as “lies and blatant fabrications”. The UK believes the men are Russian military intelligence officers who tried to kill ex-spy Sergei Skripal and his daughter Yulia in March. The Skripals survived being poisoned by the nerve agent Novichok, but Dawn Sturgess – a woman not connected to the original attack – died in July after being exposed to the same substance. “The lies and blatant fabrications in this interview given to a Russian state-sponsored TV station are an insult to the public’s intelligence,” Prime Minister Theresa May’s spokesman said. The two suspects have been named as Alexander Petrov and Ruslan Boshirov. On Wednesday Russian President Vladimir Putin said “there is nothing criminal about them” and called them “civilians”. Appearing nervous and uncomfortable, the men confirmed their names as those announced by the UK investigators – Alexander Petrov and Ruslan Boshirov. “Those are our real names,” they said. The men said they worked in the sports nutrition business and had travelled to London for a short holiday, fitting in a couple of day trips to Salisbury. “Our friends had been suggesting for a long time that we visit this wonderful town,” Mr Petrov said. Mr Boshirov added: “There is the famous Salisbury cathedral, well known not just across Europe, but probably around the whole world. They said they only stayed an hour in Salisbury on Saturday 3 March because of the snowy weather conditions. They said they returned on Sunday 4 March to visit the sights. The two men admitted they may have passed Mr Skripal’s house by chance “but we don’t know where it is located,” Mr Petrov said. When asked about Novichok, they emphatically denied carrying it, or the modified Nina Ricci perfume bottle which UK investigators say contained the substance. “For normal blokes, to be carrying women’s perfume with us, isn’t that silly?” Mr Boshirov asked. The two men told RT their lives had been “turned upside down” by the allegations. “We’re afraid to go out, we fear for ourselves, our lives and lives of our loved ones,” said Mr Boshirov. RT is Russia’s state-run international broadcaster, and the pair were interviewed by its chief editor, Margarita Simonyan. “Their passports match and the photos and the information from the British side shows it’s these people,” she said. The BBC’s Sarah Rainsford in Moscow described the interview as carefully choreographed and bizarre, pointing out that in tone and content it matched the whole Russian response to the case – flat denial mixed with mockery. 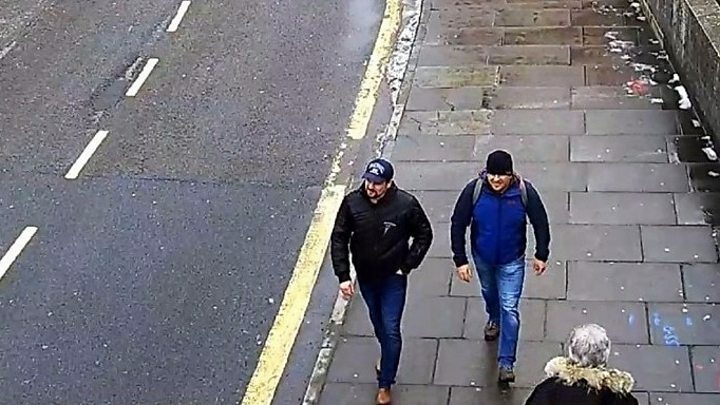 They say the purpose of the men’s visit to Salisbury on 3 March was reconnaissance, and on 4 March they returned to apply Novichok to the Skripals’ front door. The Crown Prosecution Service (CPS) says there is enough evidence to convict the two men, although it is not applying to Russia for their extradition because Russia does not extradite its own nationals. However, a European Arrest Warrant has been obtained in case they travel to the EU, and Home Secretary Sajid Javid has warned that the men will be caught and prosecuted if they ever step out of Russia. Yulia Skripal flew in to the UK from Russia on Saturday 3 March to visit her father, Sergei Skripal, a former Russian double agent who was living in Salisbury. They were found “in an extremely serious condition” on a bench outside a restaurant in Salisbury on 4 March. They spent weeks in intensive care in hospital before recovering. Ms Skripal was discharged from hospital on 9 April and her father on 18 May. They are both now in a secure location.